Hello! 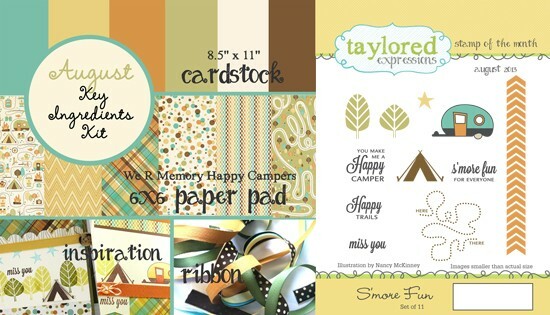 Welcome to the Taylored Expressions August Stamp of the Month Blog Hop! I combined the August Stamp of the Month (S'more Fun) with the August Key Ingredients (featuring patterned paper from the We R Memory Keepers Happy Campers collection) to make a card. I also used the coordinating Around the Campfire dies (sold separately). Accessories: Taylored Dies: Around the Campfire, Build a Scene - Mountain Tops, Build a Scene - Rolling Hills, Build a Scene - Sunshine, Build a Scene - Swirly Clouds, Banner Stacklets 1 (TE); Markers (Copic), Button, Hemp cord, Foam tape, Thread, Sewing machine. I had to pick my jaw up off the floor after seeing this amazing scene! 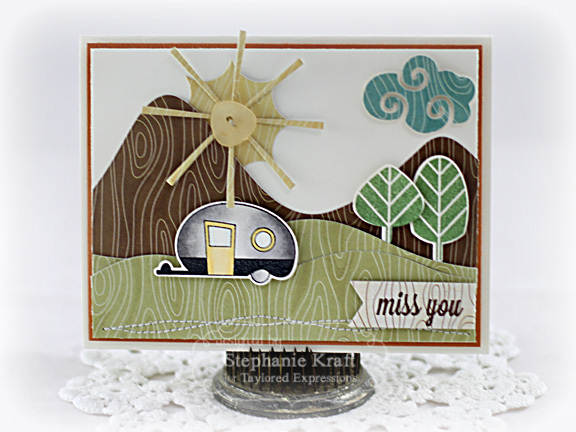 Great layout and super fun use of the new dies!! 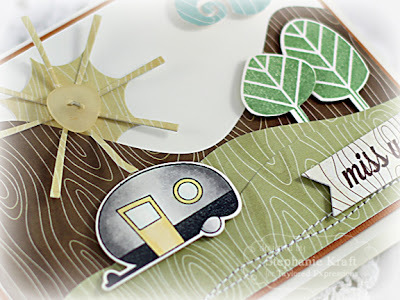 Love the patterned papers and the clever camping scene. cute card Stephanie! Love the little scene that you created! This is adorable. Love your scene. This is so adorable, Stephanie! I wouldn't have thought to use the woodgrain dp with the dies, it looks fantastic! Hugs! What a super cute card Stephanie. Love the fun scene... those hills and the sun look great. All content (including text, photographs, and artwork) is © Stephanie Kraft. My artwork (all original unless otherwise stated) is shared only for your personal inspiration and may not be copied for publication or contest submission. Thank you!